Posted on 2018-11-05 Reading Time is 5 minutes, 14 seconds. We all know what it feels like to walk into a new place and feel completely invisible. A good handshake is often all it takes to dispel that feeling, but unfortunately, our frenetic world makes it harder to personally meet the people who visit our organizations. The first time a guest walks into your facility, the welcome you give them sets the tone for the entire relationship. If, before anything else, your visitors know that they are anticipated, valued and remembered, then you have laid the foundation for a partnership built on real human connection. This is exactly what Salesforce Ventures set out to achieve with their Executive Lounge at Dreamforce this year. Their goal: to offer their portfolio companies an exclusive invite-only venue for meetings and networking. In the midst of the non-stop action of Dreamforce, the Executive Lounge was a quiet place to foster the Salesforce Ventures community. The first step in achieving that was showing each executive that they were valued the moment they walked through the door. For that, they turned to the Traction Guest visitor management system. We were thrilled when they asked us to help them run an event that would expand and define the Salesforce Ventures community—a community that we, as a Salesforce Ventures portfolio company, are also a part of. Since Salesforce Ventures invited most of their guests ahead of time, their names and other information were already in the system. This meant that as soon as they typed a few letters, autocorrect filled in the rest. 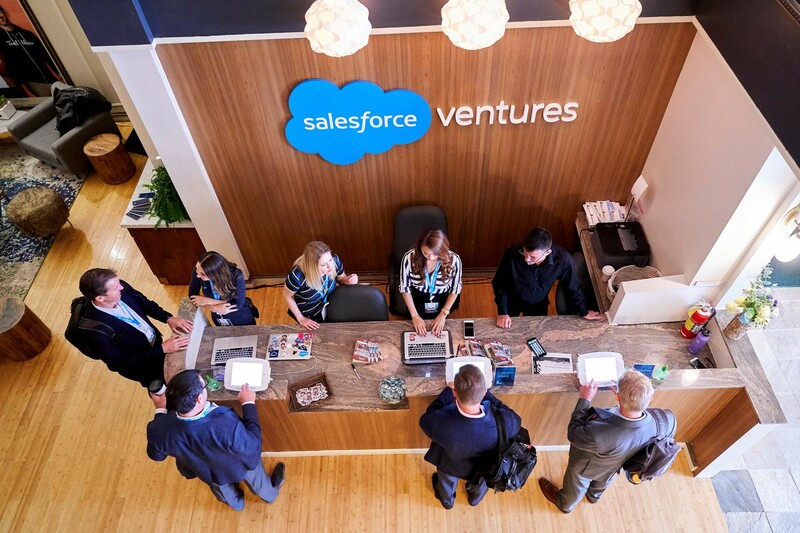 With the sign-in kiosks on the first floor and meeting rooms on the third, Salesforce Ventures needed a way to make sure that after signing in, each visitor would quickly meet a welcoming face ready to guide them. Our host notifications feature made it happen. The second a guest signed in, Traction Guest sent an instant message to the hosts on the third floor, telling them who was waiting downstairs. Along with the instant notifications, hosts also had access to every guest’s phone number so they could text them directly. “This gave everyone a high-touch experience that left our guests feeling well taken care of,” said Trista. Instead of being left to wander up to the lounge as a nameless participant, each executive was taken upstairs like a guest at a dinner party. 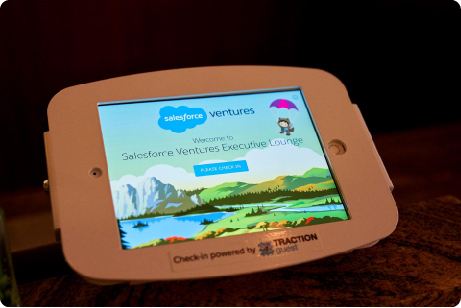 The touchscreen check-in experience gave Salesforce Ventures an opportunity to align the look and feel of the Executive Lounge with the brand identity of Dreamforce and Salesforce. The customized iPad theme was a seamless and fun way to weave the Salesforce Ventures Executive Lounge into the Dreamforce story. In a clear, unobtrusive, non-verbal way, it told guests that they were in the right place and in good hands. 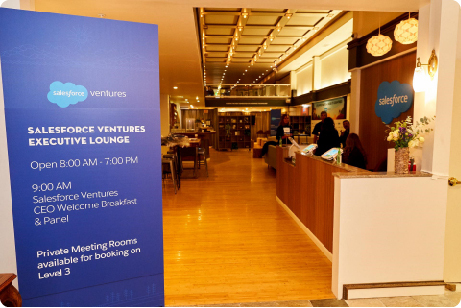 Those features helped Salesforce Ventures make sure that the Executive Lounge, before anything else, established authentic connections with the people they were inviting into their community. But once the introductions have been made, there’s a lot more Traction Guest can do to help organizations nurture their many relationships. Through its unique integration with Salesforce, Traction Guest allows hosts to automatically move each guest’s information directly into their Salesforce org. Connecting Guest data to Salesforce makes it impossible to forget an acquaintance; all you have to do is look them up! Visitor Management Systems like Traction Guest give you the tools to make every single person who walks into your organization feel like a valued individual and not just another face. Whatever product or service you offer, building authentic relationships is the first and most important business strategy there is. To see how Traction Guest can help you make better connections, book a free demo.